San Juan isn’t a game likely to excite a casual browser. It’s well thought of by those of us that haunt online board-game forums like a bunch of withered tree goblins. Those possessed of less esoteric passions will probably bounce right off the dull theme and uninspiring box. Give it a chance though – we gave it a four star review to indicate there is plenty of value in the game for those willing to persevere. Let’s see though whether it’s your willingness to play, or the game’s accessibility, that turns out to be the primary limiting factor. We’ve got a clean bill of health here – where colour is used in San Juan it is largely as emphasis, not as information. Each different kind of production building has its own colour, but each also has its name and a description of its effect clearly displayed on the card itself. In San Juan, first you get the sugar, then you get the power. These colours match up to the value charts used during the trading phase but the colours remain reasonably distinctive even when viewed through a colour blind palette. In any case there are only five goods and their relative value is easily memorised in cases where monochromacy must be considered. 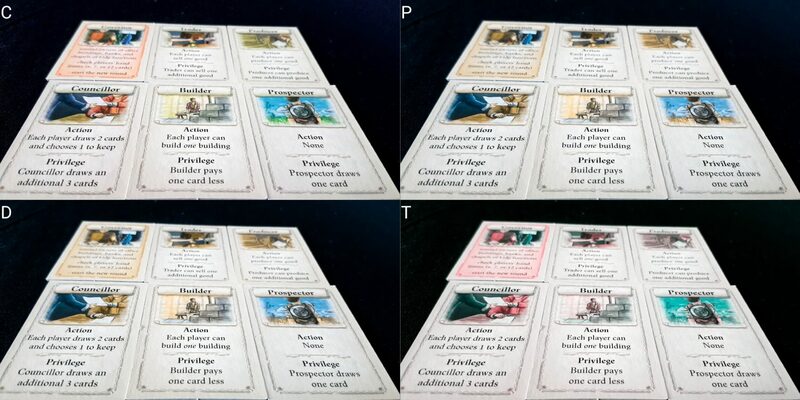 The only role card with colour as an identifier is the governor, and it is possession of that role rather than the colour itself that is the key element of gameplay information. Everything else is largely unornamented. For conditions short of monochromacy the additional identification offered by colour when picking out city and production buildings remains in effect even if the specific hues may change. Nobody should have a difficulty picking out which buildings are which. As such, we strongly recommend San Juan in this category. Since San Juan is a card game we run into the usual issue here – those for whom total blindness must be considered will find the game all but impossible to play. There is no tactility to the game that would offer a physical affordance or access to key information. The discussion here focuses then on players for whom examination of the game, with the use of suitable assistive aides, is possible. With that in mind, the largest single problem here comes in visually parsing what may be going on in settlements other than your own. Individual cards are well contrasted with a generously proportioned font. Key information is always in the same place, and font ornamentation is used to highlight phase information and when cards take effect. Players will be making use of a hand of hidden cards during play and this might comprise of as many as twelve cards depending on which buildings are available. These cards cycle rapidly since they’re used as currency as well as architectural options. The cards permit relatively easy close examination, but they are going to change often. In-hand management is primarily a triage – working out what you can safely spend versus what you need to keep. It’s going to be straightforward to do that, but it’ll be time consuming. The trading charts do a good job of highlighting the precedence of goods by linking it to both sequential order of value and the colour of the buildings. 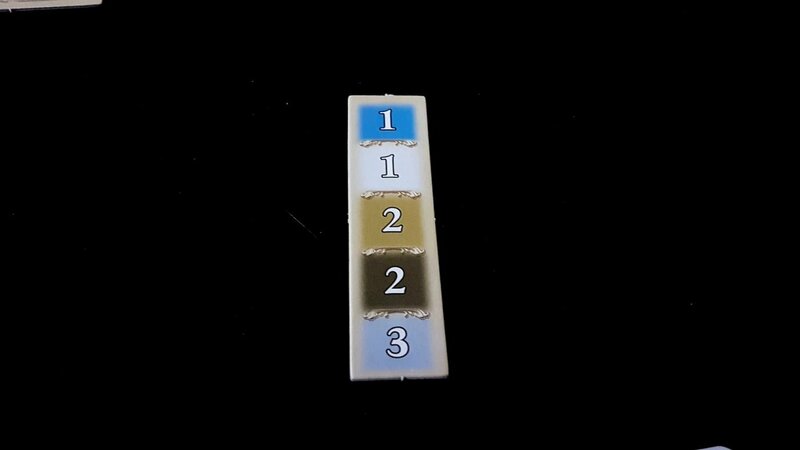 Contrast on these too is mostly very good, meaning that even though it’s a small and relatively fiddly component it shouldn’t present a problem. 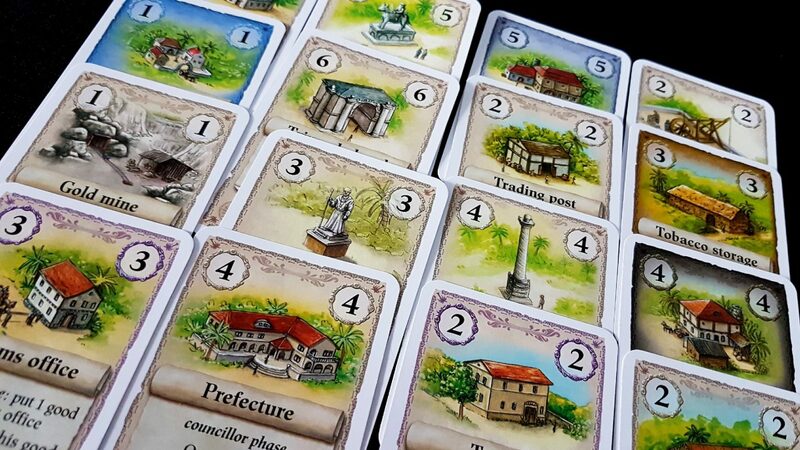 At one level, the only information you need to play San Juan is how many buildings everyone has constructed. However, deeper play must be influenced by the extent your role selection benefits your opponents because that influences the weighting you need to give to the decision. If you know an opponent has zero cards in their hand, you might feel safe in selecting the builder. If you know they’ve already used up all their production capacity, the value of the production role shifts. If you know they have nothing to sell, that will influence the wisdom of selecting a trader. The various special buildings they have constructed all exert a powerful influence on the way you need to approach role selection. Functional play doesn’t require this kind of knowledge, but effective play mandates it. This is especially critical in San Juan because it is very easy to overly advantage an opponent with a careless pick – it’s entirely possible to trigger an action that is much more beneficial for your opponent than it is for you. Again, the game does well in making key information as accessible as possible but there’s only so far it can help when important game state may be spread between forty or more visible cards spread around a table. Close examination is possible here – none of the player tableaus are secret. It’s far from ideal with regards to the issues related to this category regardless. 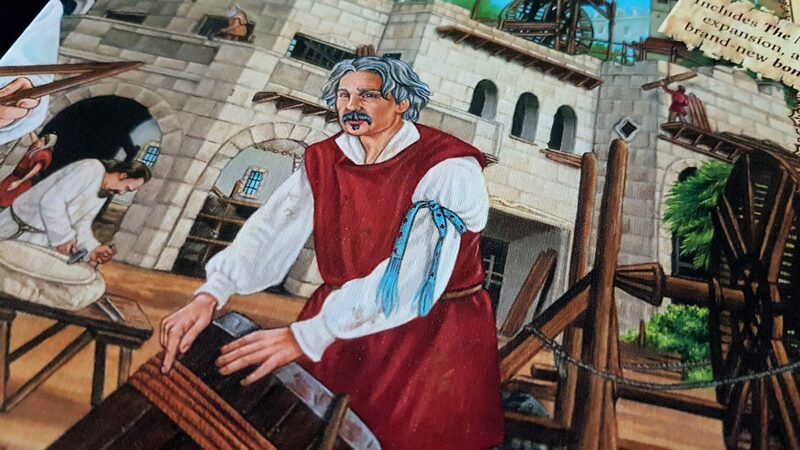 All of this seems quite negative but there is an upswing here – San Juan is a game that offers vanishingly little opportunity, beyond the selection of a role itself, to influence the success of your opponents. The consequence of that is that you don’t really leak much actionable intention by asking people what benefit they’ll get when you select a role. ‘When you select trade I’ll be able to sell two silver’, ‘I have six cards with which I can build, and I get a one card discount on city buildings’. At the point you’re selecting your role, there’s nothing they can do to change the course of fate. Provided people don’t mind narrating the implication of the actions they take, it’s our view it’s possible to find a sweet spot at which the game works. It’s not just functionally playable, but meaningfully playable. That’s an important distinction in a game like this. We recommend San Juan in this category, with the caveats and provisos outlined above. For every high there is a low, for every stop there is a go. The issues we discussed above with regards to visual accessibility are the same ones that likely render San Juan a troublesome prospect for play in this category. Let’s break that down into two theoretical San Juan games. The first is the functionally playable game. This requires a reasonable amount of explicit numeracy, a relatively large degree of formal literacy, and the ability to calculate costs and spend cards appropriately. Selecting cards from a hand requires an awareness of building effects (primarily whatever bonuses and discounts they apply), the role context, and the relative value of each card. I don’t think given the relatively simple rules that playing the game as a simple tableau builder would present an insurmountable cognitive challenge. Provided these elements can be understood, with support, you could probably create a stripped down deck of cards that was playable without too much difficulty. But the thing is – that’s not San Juan. For the real game of San Juan we must look into the meaningfully playable elements. This requires an appreciation of a much deeper relationship between the mechanical systems. San Juan is a game of chains and combos and complex synergies. 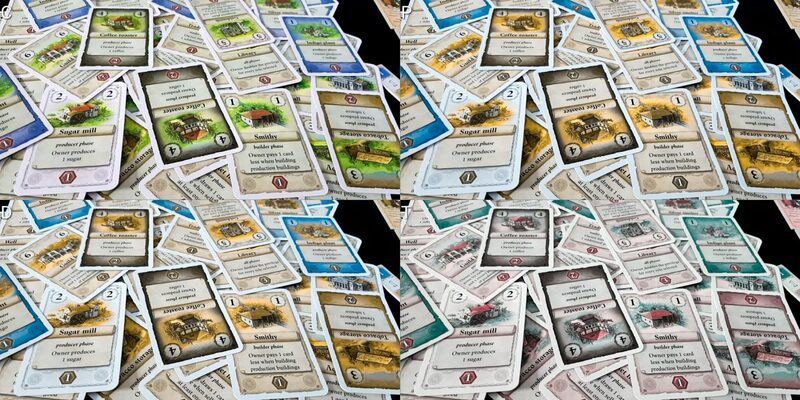 The settlement you are constructing is an intricate engine and every card is an important cog that needs to be placed at the right time, in the right combinations. You need a plan for every piece of that engine – you will only ever have a maximum of twelve cards to place, and you can’t really waste any of them if you want to do well. That in turn means players need to appreciate the composition of the deck, and what’s likely to appear. That itself is more difficult than usual because San Juan explicitly requires cards to be discarded face down so as to obscure which buildings have been consumed as goods. We talked about some example settlements in the review, where buildings radically altered the value proposition of the roles available. If you want to get good at San Juan, that’s what you need to have in mind with every play and be prepared to time every decision in such a way as to harmonise with the tempo of the game. San Juan does not permit players of differing ability to play well together – the better players will almost always crush the weaker players, and that’s almost always an indicator of issues in this category. Explicit synergies in the cards exist in terms of building combinations, but also in terms of how they work with roles and with role precedence. Some buildings will render the selection of individual roles by a player unnecessary. Others will practically mandate it. Others still will make roles less desirable because they permit advantage to accrue to other players. The prefecture for example permits a player to keep two cards during the councillor phase. Everyone else can keep only one. 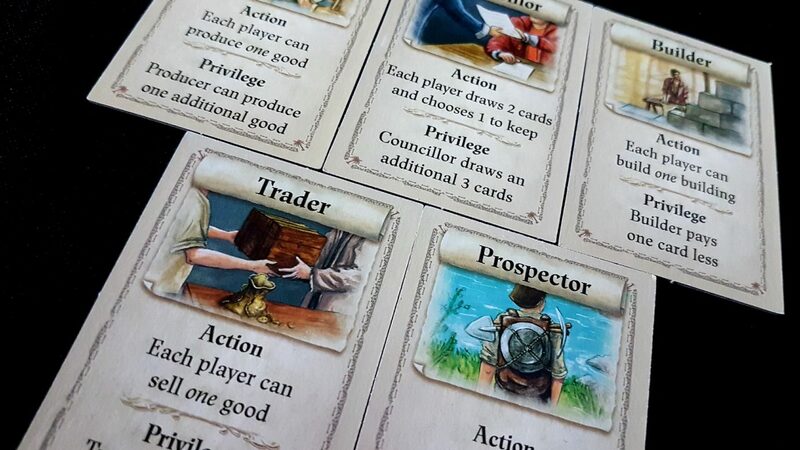 The privilege of that role is that the player gets to choose from a selection of four cards rather than two. If you suspect an opponent is only interested in cards as currency you’re doing yourself an injury when you select that role and gift them two free cards. Role value is constantly shifting depending on what’s in the settlements and what’s in a player’s hand. This is all deeply contextual, and not easily simplified. The game flow too is highly malleable. The order in which players take turns remains constant, but first player changes every round and the order in which actions are taken will change, as will the set of actions themselves. There are certain fixed points in play, but these are limited and the actions undertaken for these might change. At the governor phase everyone discards down to seven cards, unless a player has the tower. Players might elect to make use of the bank, or the chapel, during this phase if one is available. Everyone may end up doing a substantially different thing for the same role activity. 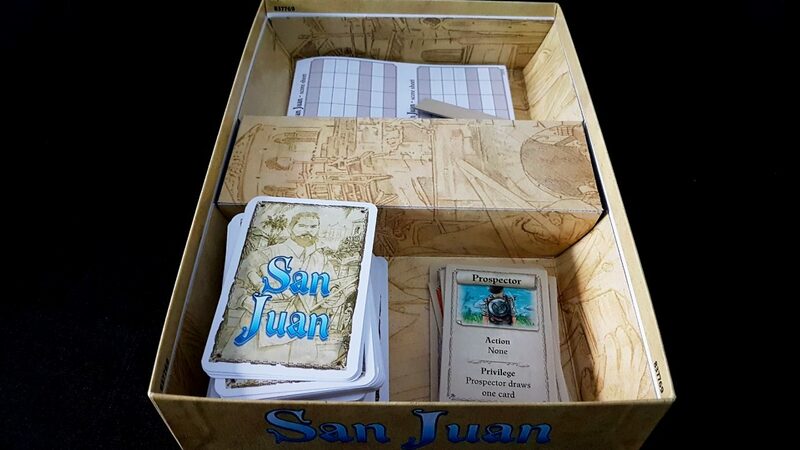 Essentially then – the functional game of San Juan doesn’t offer a lot of scope for real enjoyment (and still has a relatively high bar in terms of numeracy and literacy) and the meaningful game involves far too many subtly interacting parts. We strongly recommend you avoid San Juan if accessibility in either of our cognitive categories is a major consideration. 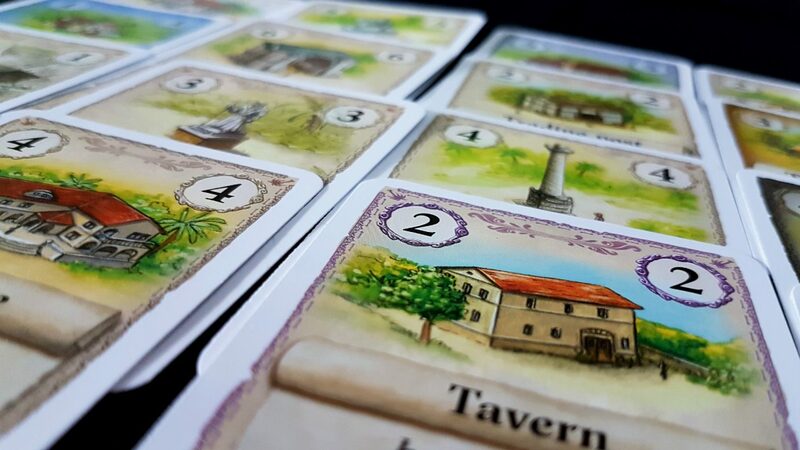 There are very few ways to directly interfere with other players in San Juan – a few cards in the second edition box belong to an expansion, and they offer some limited PvP options. On the whole though, this is a game where you don’t get to do much that can impact upon your opponents. That avoids many elements that we usually consider here, particularly king-making, ganging up, and player elimination. There are though some other issues that may be problematic. Score disparities can be extremely high if someone has not played well, and mistakes are largely impossible to undo. 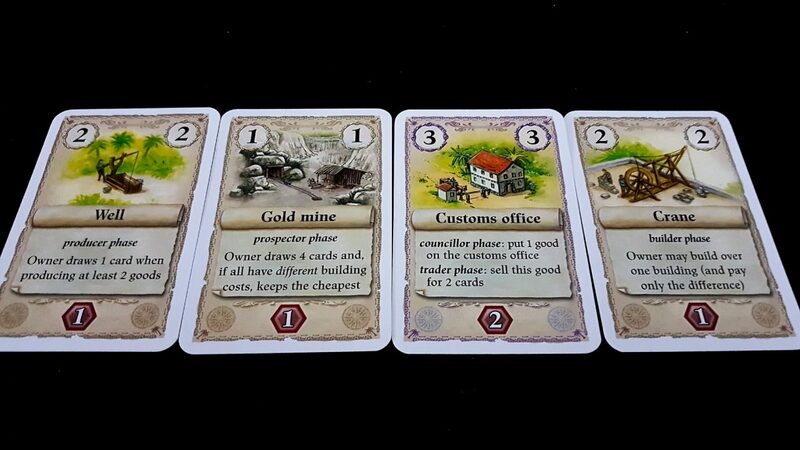 A big part of San Juan is being able to anticipate the nature of the settlement you must build based on the cards you draw. If you make mistakes early you will often find yourself hugely disadvantaged as a result. As an example of this – if you build an aqueduct (produce one extra good) as your second building you’ll have a bonus you are unable to use because you only have a single indigo plant. As a result of building the aqueduct you’ll have fewer cards, and be unable to generate sufficient income to make up for your early misstep. In the meantime, those that invested in more immediately useful resources begin to race ahead. There is a pressure in San Juan to build constantly – you don’t get to build twelve buildings and then you’re done. You’re done when anyone has built twelve buildings. If you fall out of the tempo of play you may find it very difficult to find the beat once again. Coupled to that can be frustration that the roles people select are actively causing you problems. Role selection is really the only way in which anyone can interfere with the plans of someone else. While that’s implicit, it can also be quite pointed. You may have no cards and someone picks a build option. You may have no free production capacity and someone chooses to produce. You may have no goods left and someone triggers trading. It’s all fair game for someone to pick a role based on what it does to the game as a whole rather than what it does for their own individual prospects. That though doesn’t ease the tensions it might cause. Overall though the nature of play in San Juan isn’t likely to really tickle many of the emotional trigger issues that may raise their heads here, so we’re prepared to offer a recommendation. Picking a random trading chart and removing the cards from under production buildings, trading them in for the correct number of cards. Selecting a card to build from your hand and then discarding the correct number of cards. It’s entirely possible that the hand you end up with at the conclusion of a round has no similarity at all with the one with which you started. It might be bigger, or smaller, and made up of completely different cards. Hand limits generally are seven, but rise to twelve with the construction of a tower. Regardless of the hand limit though that’s a lot of card manipulation, every single round. If fine motor control isn’t a problem, that’s not going to cause anyone any difficulties. However, if direct and continual card manipulation is difficult then we move to the ease of verbalisation. Here, the story is generally positive except for the unusually large load placed on whatever player is making physical moves on another’s behalf. The communication between these two players will be constant, and often cumbersome. ‘Build card one using cards three, five and seven. That means that I draw a new card’, then almost immediately ‘sell my two silver goods – that’ll get me six cards, but I also get two for my bonus buildings’ and then right after that ‘discard cards four, seven and eight to bring me down to seven’. And then it all starts up right again. This isn’t a game where a supporting player has to act on someone else’s behalf once a round – this is a game where they act for every chosen action in a round. It’s certainly not a deal-breaker, but bear it in mind when considering the game. We’ll tentatively recommend San Juan in this category. Most of the art in San Juan represents humans as tiny components milling around larger buildings. The building cards in particular focus on location rather than the people within. Twist – they were all headless ALL ALONG. On the cover it’s almost exclusively men. And they say games don’t do a good job of representing women. So yeah, while there isn’t a great deal of gendered art what’s present suggests that San Juan is a city where women don’t have much to contribute. The manual at least doesn’t default to masculinity, adopting gender neutral terms such as ‘the player’. In terms of cost, San Juan comes in at an RRP of £30 which is a little on the pricey end for a game with so few components. It does support all player counts well though, but at four players it tops out quite quickly and as a result won’t be a great prospect for larger game nights. My own personal gripe here is that it also comes in a box that is either stupidly large or infuriatingly small. It depends on your perspective. There’s a lot of air in this box. But it’s also a game that should nestle nicely beside its bigger brother Puerto Rico and it doesn’t – everything about the box makes it look as if it’s a companion game, but the box size is too small to make it work. Box sizes are a constant frustration of mine – it’s not really an issue for sensible people, but I wanted to vent. We’ll recommend San Juan in this category, with the provisos outlined above. The reading level associated with San Juan is quite high, and while the language is all precisely functional it’s sometimes quite intricate and often ambiguous. The card instructions for the bank, as an example, lack any real context without reference to the manual for full information. They say what you can do with the bank, but they don’t say what that accomplishes. This isn’t a game you can play without reasonable literacy in the game’s language and sometimes a degree of cross-referencing against the manual. Otherwise, no communication at all is required – you’ll all be too focused on your individual settlements to have much time for chit-chat anyway. We recommend San Juan in this category, although not for those where literacy may be the communicative barrier. The hidden hands you’ll be making use of involve a fair degree of assessment on a regular basis. If dealing with an intersection of visual and physical impairment, this may be infeasible given the large number of cards that must be continually evaluated. In-hand management is critical here. Also a consideration is that appreciation of the context represented by other tableaus may require a degree of close inspection and this may not be possible if physical mobility is limited. 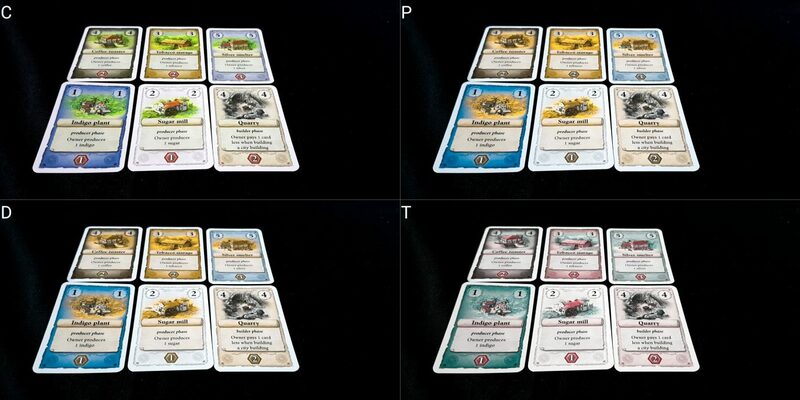 While tableaus don’t change as quickly as in-hand cards, they do evolve rapidly and have often subtle inter-relationships between architectural elements. San Juan does support dropping out reasonably elegantly, although there is almost no possibility a player can rejoin play given the pace of construction. The only real relationship players have is expressed through role selection. If a player drops out, later rounds will become less impactful than earlier turns but this will largely self-balance as time goes by. If dropping down to two players, the usual mechanic of the governor selecting two actions in their round would be an easy enough switch. 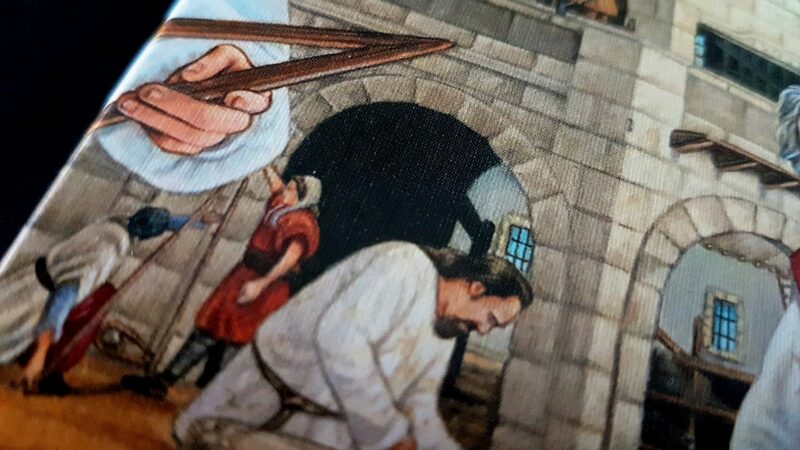 Games of San Juan don’t last especially long, but the nature of turns is that they interleave – you can’t finish up your turn and then take a short breather while everyone else is thinking. Downtime in San Juan is negligible – as soon as someone picks their action, you’re involved in the game once more. That’s great from the perspective of emotional and cognitive intersections where attention may be a resource that requires careful management. It’s less great when dealing with conditions of modulating severity – there are no brief moments of respite in play, and this tends to increase the intensity of the experience. A game of San Juan may be over in less than an hour, but that hour asks more of its players than an hour of many other games. For those where intersectional issues exist between the communicative and physical categories, verbalisation would put the game out of contention for almost all players. The amount of communication is considerably greater than is often true in these cases, and the interleaving nature of turns intensifies these requirements. In this situation, we’d suggest you avoid the game. A clean aesthetic does wonders for San Juan here. 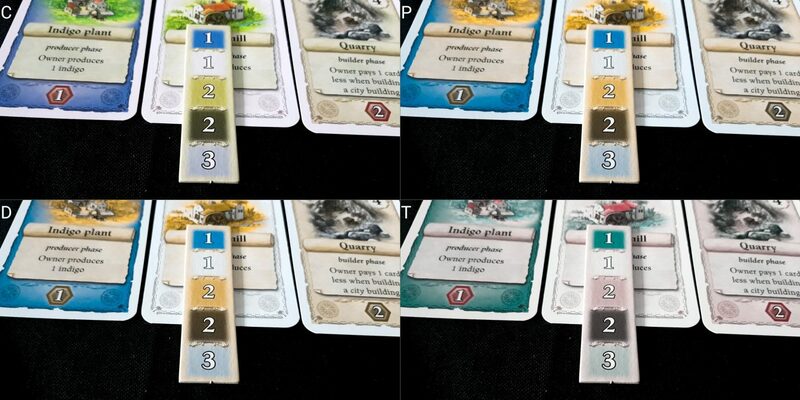 While its cognitive accessibility is a function of its depth and complexity, the visual section would have been a good deal more critical were the game components not so well presented. The deep synergies between game elements and the rapid cycling of cards are interesting for the way they cross accessibility categories. Often particular gameplay mechanics are confined to a single discussion – here, the nature of play cuts across all. Building synergy creates opportunities for card cycling which puts pressure on communication regimes. Card cycling creates new opportunities for synergy, which puts pressure on visual parsing. Everything in San Juan is so tightly connected that it can’t help but impact on everything else. With four shiny stars to its name, we think San Juan is a game that offers a lot to those prepared to make the effort. While it’s certainly not going to work for many players, if you believe it might be suitable for you we’d certainly suggest it’s fun enough to warrant the attempt to explore its ever-shifting intricacies.